At Össur, we do things differently. That’s why RHEO KNEE XC and RHEO KNEE feature the highly-responsive magnetorheologic technology popularized by the aerospace and automotive industries. Designed for a variety of users and circumstances, RHEO KNEE and RHEO KNEE XC deliver confidence-boosting stability and a dynamic experience for users who want to get the most out of their prosthetic solution. The dynamic capabilities that make RHEO KNEE® XC ideal for work and home also help to make it safe and effective for rehabilitation, eliminating the need to train users on a mechanical knee before transitioning them to a micro-processor knee. From rehab, to the home and office, to the gym and the trail, RHEO KNEE XC confidently goes anywhere - whether rehabbing on a spin cycle, navigating tight spaces, strolling around town, or hiking a trail in the rain. RHEO KNEE is capable of shifting almost instantaneously from the high resistance required for stability in stance phase, to the zero resistance needed for a dynamic, free swing phase. The resultant “zero lag” user-experience simulates the natural function of a physiological knee joint and produces a fast, accurate response to changes in direction, speed and terrain, without the need to select any specific mode. RHEO KNEE® XC and RHEO KNEE now come with the enhanced ÖSSUR LOGIC App. As well as access to activity reports and settings for clinical use, it now provides essential training exercises for users, enabling them to practice different movements at home and quickly gain confidence in their new prosthetic limb. ENHANCED STABILITY CONTROL – allowing clinicians to adjust the device’s setting to accommodate the earlier stages of rehab, facilitating the transition from any other knee to RHEO KNEE and RHEO KNEE XC. 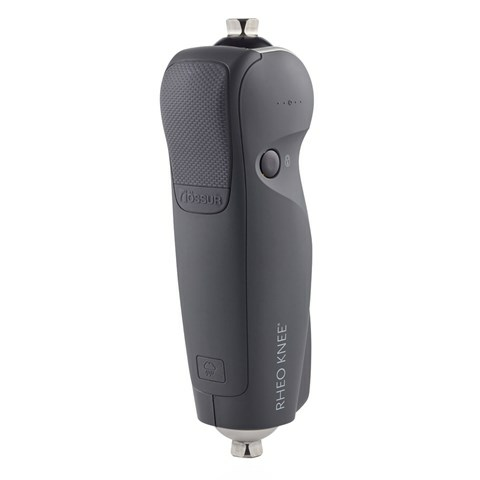 Discover more about RHEO KNEE and RHEO KNEE XC here.